In a new (hopefully permanent) feature on the blog a closer look will be taken at the goals in Blackpool matches with a view to understanding them in greater detail. Usual tactical articles will still come along, but finding the time and resources to make them genuinely worthwhile are much harder this season now Blackpool are playing Championship football. Watching the Cardiff goal in the first instance there are at least three points of failure for Blackpool. As much as Joe Mason scored the goal, poor Blackpool defending presented the chance. However, before looking at the points of failure it’s important to note why Blackpool ended up defending so close to the goal. Goals may be scored in a split second, but quite often there’s a stacking up of incidents leading to the goal. They act as a warning to the defensive team that they need to be aware in order to snuff out danger at the earliest opportunity. In this instance, Cardiff got in between Blackpool lines of defence and midfield catching Blackpool out of shape in defence. Remember, this is in the lead up to the goal. 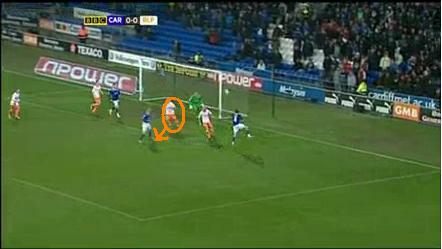 Crainey (circled) is caught high up the pitch, Cardiff advance. The picture above shows how Stephen Crainey was caught a little high up the pitch and Danny Wilson was dragged over to deal with the oncoming player leaving far too much space between him and Craig Cathcart. It is here were teams have often picked apart Blackpool. The picture below shows how there’s a clear pass on in behind Cathcart for Kenny Miller. Instead of taking that option Mason spreads the play wide. As he opts to do that Cathcart goes to put pressure on the ball and pulls the whole Blackpool defence out of shape. 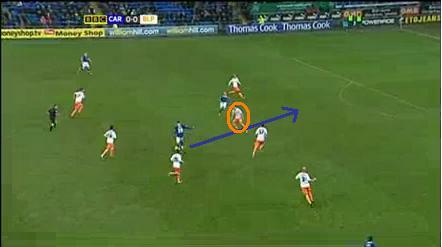 The blue arrow indicates the play that could have caught Blackpool out, whilst Cathcart (circled) steps up. It is at this point where Blackpool are at stress point. They are being turned around and need to regroup their shape and become aware of the positions taken up by their opponents. Alex Baptiste goes to apply pressure to the man on the ball and Chris Basham drops to cover at right back. Now the errors start to mount up. Arguably they were the result of poor defending, but not helped by being pulled out of shape and having to recover shape whilst being turned to face their goal. 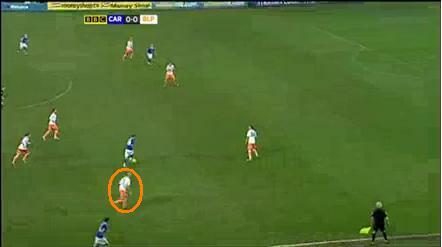 Blackpool centre back (circled) getting in front of their men. Note Don Cowie is a spare man at the back post, unmarked. Both centre backs get themselves in poor positions in front of the men they should mark causing a knock on effect. Cathcart is marking space with Mason taking up position behind him. Wilson monitors Miller but realising he has to go to Mason passes on the marking of Miller to pick up Mason, however, he is unaware that Crainey is outnumbered at the back post. 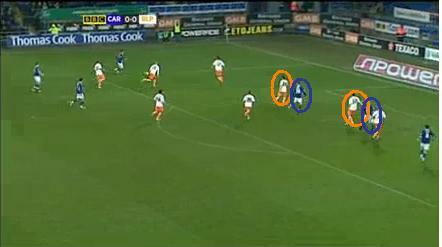 This is a combination of positioning, awareness and organisation not functioning very well as there were three Cardiff players in relation to three Blackpool players. Wilson (circled) moves out to the man in anticipation. In trying to anticipate the knock down by Don Cowie, Danny Wilson goes forward to the nearest man. Had he held his position he could have cut the ball out easily. In thinking that Wilson has the ball covered Cathcart switches off instead on staying goal side of Mason and on his toes ready for the worst case scenario. Mason then steals in front of Cathcart to score. This just highlights how goals can be conceded through not dealing with the matter at hand at the earliest opportunity. Nothing has been said about the excellent work that Cardiff did to score the goal. The ghosting movement of Cowie to sneak around the back. The awareness when crossing the ball to pick out Cowie at the back post and the anticipation of Mason to steal in front of Cathcart. It gives Blackpool a good few things to think about from a defensive point of view, but will not take anything away from a good three points on their travels as perhaps the dreaming may start once again.